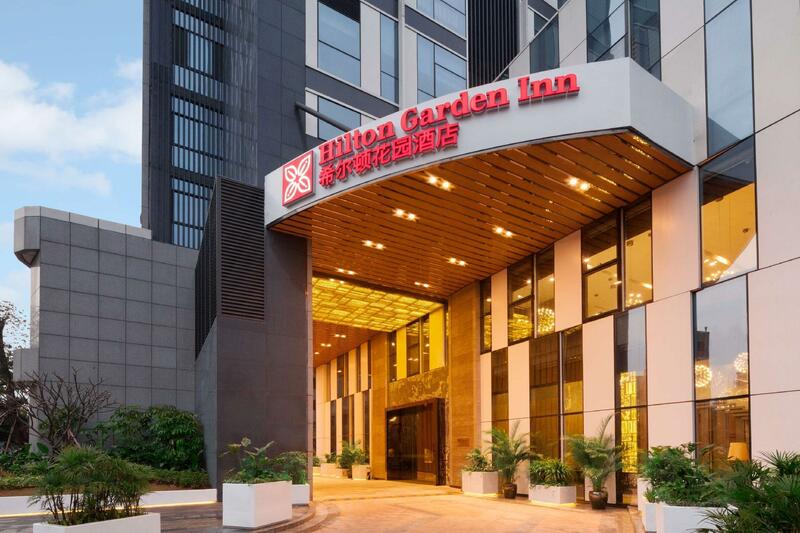 Имате въпрос към Hilton Garden Inn Shenzhen Bao An? 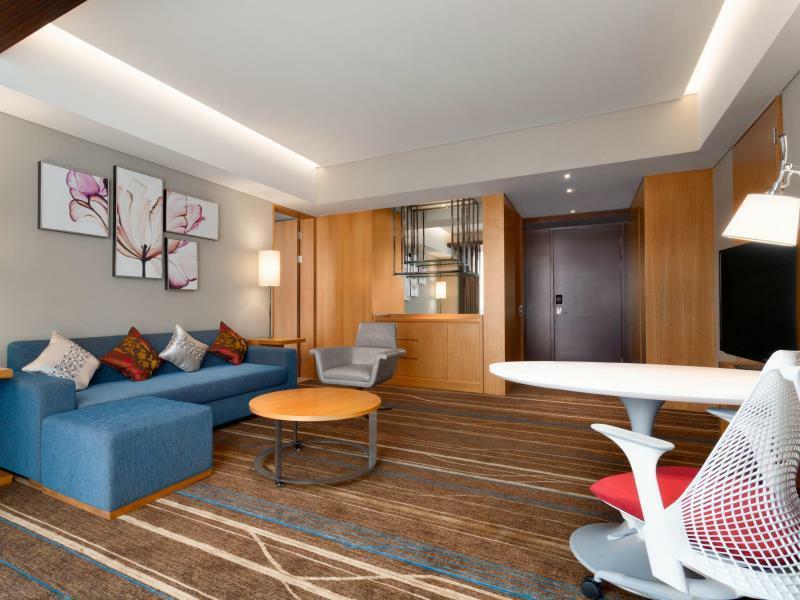 Удобно проектиран като за бизнесмени така и за почиващи туристи, Hilton Garden Inn Shenzhen Bao An е идеално разположен в Район Bao'an - една от най-посещаваните части на града. Само на 46 km от градския център- това стратегическото местоположение на хотела гарантира на гостите си бърз и лесен начин за достигане до интересуващите ги точки на града. С удобното си местоположение хотелът предлага лесен достъп до всички градски забележителности, които задължително трябва да се видят. Съоръженията и услугите предлагани в Hilton Garden Inn Shenzhen Bao An гарантират Вашия приятен престой. Гостите на хотела могат да ползват съоръжения като 24-часов рум-сервиз, безплатен WiFi достъп във всички стаи, 24-часова рецепция, съоръжения за инвалиди, експресно настаняване/напускане. 210 стаи са разположени на 11 етажа като във всяка една от тях цари неповторимото усещане за домашен уют. Модерен комфорт с удобства като телевизор с плосък екран, достъп до интернет (безжичен), безжичен интернет достъп (безплатен), стаи за непушачи, климатик са на разположение в определени стаи. Освен това в хотела можете да се възползвате от множество предложения за приятно прекарване на свободното време. С перфектното си местоположение и несравними удобства, Hilton Garden Inn Shenzhen Bao An е един чудесен избор в много отношения. Children under 120 centimeters will be charged half the adult price for breakfast. Nice bed and nice situation. Only the shower is not hot enough. Be sure to think about travel options when staying here. Takes about an hour to get to downtown ( e.g. Futian ) via MRT. MRT is close enough to walk to but not if you have baggage. Airport is about 80-100RMB taxi ride. As for the hotel itself.... excellent. Typically China hotels are not great - often advertising 5 stars and really being 2 stars. This hotel its top quality and very nice. having the standard of any Hilton. Location wise wasn't great as there isn't much things ard the hotel and difficult to get a cab. Room is great though I like the deco, its comfortable to say the less. 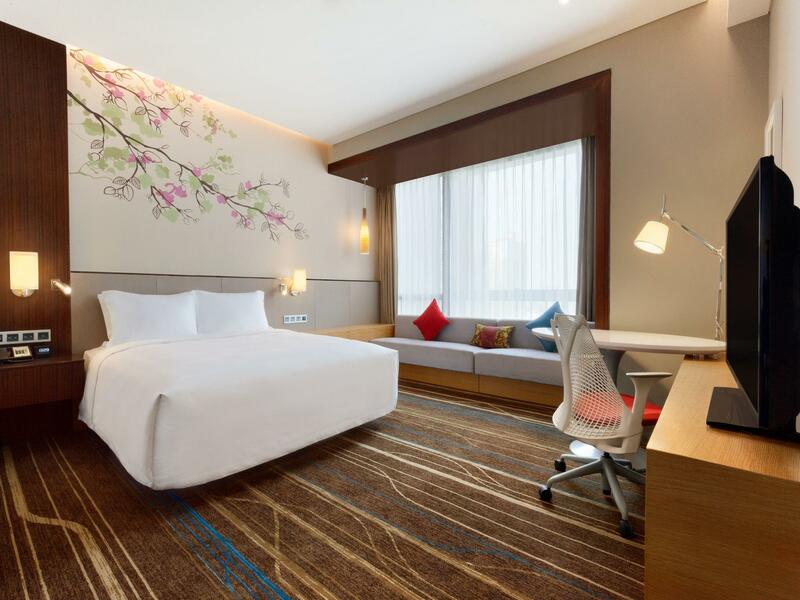 This is a business hotel, so don’t expect to do tourist activities if you’re booked in this property. The room was clean, the fitness center was functional, and the staff was friendly. There’s a mall called WeMall which is adjacent to the hotel. It houses a decent-sized Walmart, plus few restaurants. We liked the dimsum at the Taste Heen restaurant. Tip: The shopping district, highlighted by the best mall in the area (Kingkey Mall), is about 30 minutes away on foot. The hotel staff will tell you it’s a 15-minute walk but do not be misguided. The distance is also too short for taxis to drive you to, so you really have no choice but to walk. Seem to me like a newly renovated hotel. Location is good. A 15 mins walk will reach a train station. Eateries are all around the hotel. Walmart supermarket is just next to it. A shopping mall is closer to the train station. Despite being in a very remote part of the city there are plenty of shops around the hotel including a Walmart and Burger King. As far as the hotel is concerned, it's a pretty standard hotel and nothing exciting about this place. However, if you are just looking for a place to sleep in a quiet area then this is a good choice. We were quite dissappointted with our stay in this hotel. Location is quite out from town and the hotel didnt show any Hilton standard. There is no bell boy to help on the baggages and the room is not allow to add extra bed. The reception staffs is not friendly and helpful. Overall i think this hotel cant represent Hilton brand. Not a big deal hotel while the stay is acceptable with nice bed. There are many shops and a small mall within walking distance. Pull over for only 1 night. nothing much to compliant while the cab drivers are out there to ripe your money. Room was comfortable, staff were friendly and breakfast buffet was decent. Great place to come back to, though the location is a bit out of the way. Not near to any train or MTR station. Special thanks to Ms Wei who helped to guide my taxi uncle to the hotel. The ride wasn't pleasant but the experience at the hotel was great. Thank you. Found a gem in Bo'an district, it's just a 20 mins taxi ride from the airport. Entering the hotel lobby, we were welcome by their English speaking staff when we arrived late midnite. 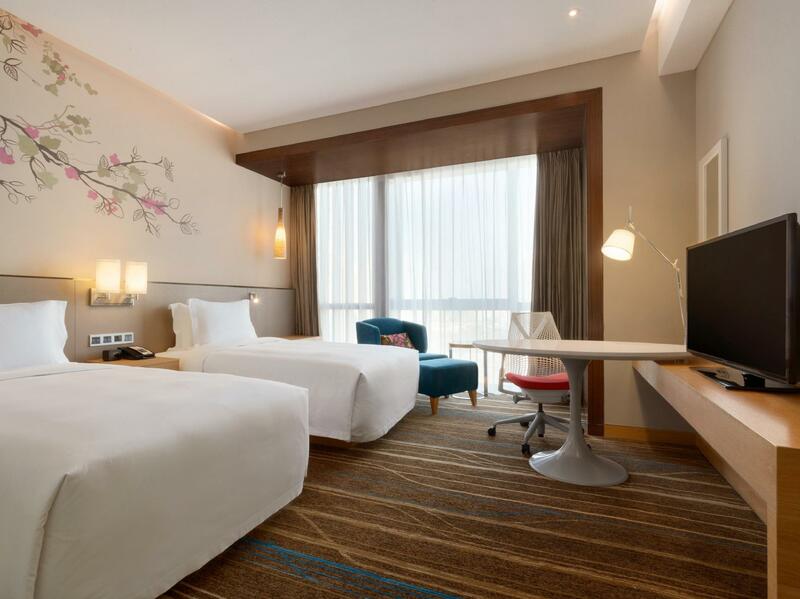 It's a newly opened hotel with clean and great room. Exclusive toiletries, iron/iron board is provided in the room. A enjoyable stay and would want to come back next time. Though it's further away from Shenzhen city center area (Futian, Nanshan etc), it's closer to SZX airport. The hotel grand lobby is wonderful, greeted with English speaking staff. There were a lot of choices for buffet breakfast. 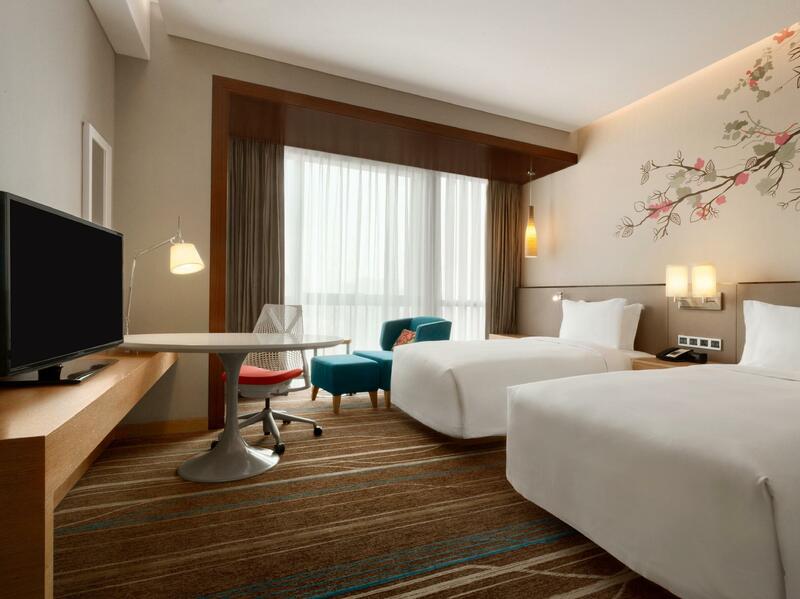 Exclusive toiletries, iron/iron board is provided in the room. Do not expect to have a great view from the hotel, coz there're a lot of construction nearby currently. There's a large Walmart at the basement floor & food street next door. Would love to stay again next time. Although I have to drive still another 30 minutes to our partners place from the hotel, it's well worth it. 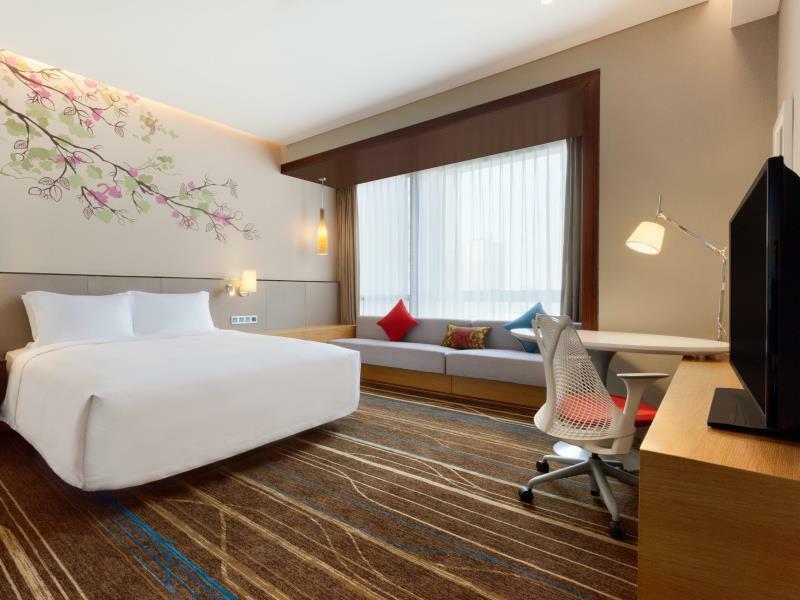 In my opinion, there is not much reason to take one of the classical Chinese budget hotels, if you have this choice; the staff is very attentive and professional and speak excellent English. The rooms are very comfortable, the beds are a joy and the hotel is generally very clean. If you need to get some work done, the internet connection is open (no firewall), fast and reliable. The only drawback is a bit the location; there is no public transport available. The staff can help you to get a taxi out of there, but getting there is not always easy. Make sure you have a printout with you. I can really recommend the hotel and will be there again. We had a great stay at this hotel. The staff is professional, some speak English fluently (but all speak some). The room has a good size, is very clean and offers a great comfort. It speaks for itself that the hotel will have only its first anniversary soon. The restaurant was great and offers a very good buffet, if you're a seafood lover. Also the bar on the first floor is a great place to stay. The area itself is what it is. The Bao An avenue is much longer than I expected, so I was still 40 minutes by taxi from my working place. Check this up first! There is a Walmart within 1 minute walking of the hotel, so you can get anything you'd need from there! And there're plenty of McDonalds and Burger Kings nearby, if you crave this sort of thing. I will most likely return, despite the distance to the working place, because of its high standard at a great price. Therefore, I can really recommend it. it`s good hotel .i enjoyed my staying in a certain ways . everything was new and clean and room were very nice . front desk staff were very helpful upon C/I.the concierge staff have to give guest feedback if there have problem with taxi about change the taxi on the half way of airport. Since it is new, the taxi drivers don't know it yet. However, the front desk person spoke to the taxi driver and we found it pretty easily. We arrived very late at night, and the front desk agent was well prepared with our reservation and spoke English well. The morning agents were also friendly and efficient. 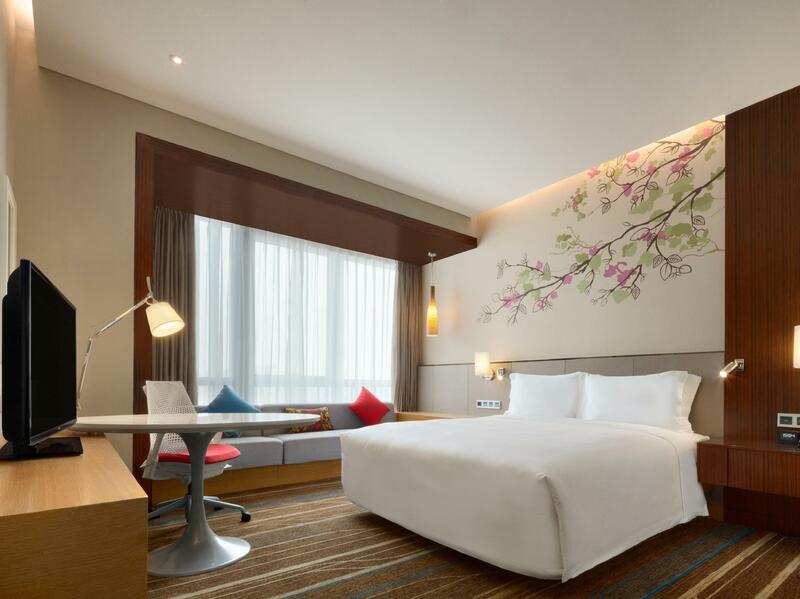 A good hotel that is above average for service, cleanliness and food. I would stay again.